Things are still going great. Today was a relaxing day in the hospital. 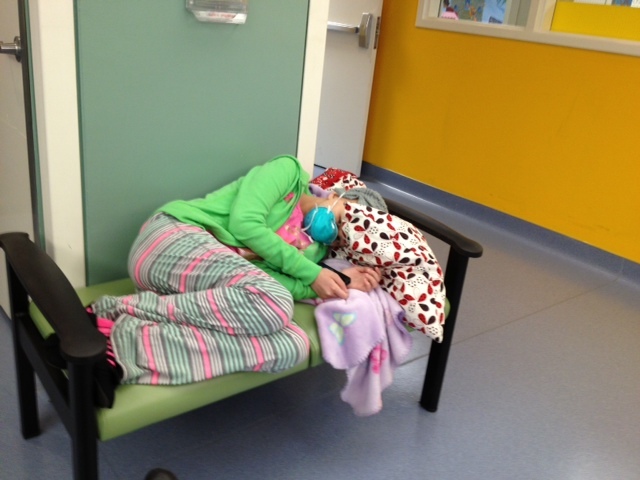 In between watching movies, playing on her phone, and sleeping, staff worked to keep Ashtyn comfortable and manage any side effects she experienced. 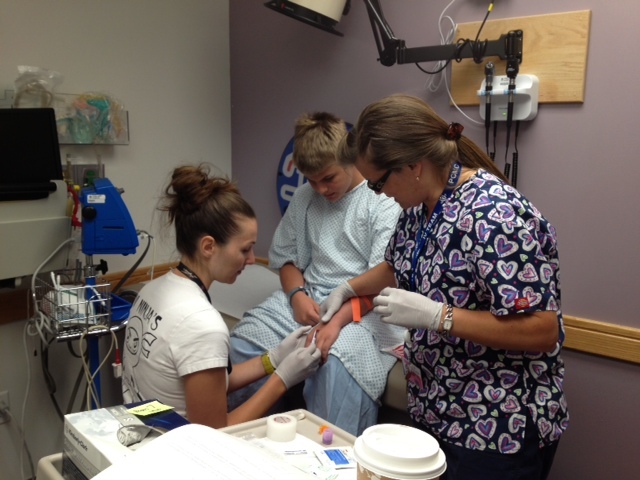 After Chandler donated his marrow, it was tested for any infections before it was given to Ashtyn. Whether it had an infection or not, it would still be given to Ashtyn but they would know what to treat her for. Today the blood culture from his marrow came back positive for a staph epidermidis infection. This type of staph is a bacteria that is found on everyone’s skin and not a type of life threatening infection that many people think of when they hear the word “staph”. The concern that it would affect Ashtyn was minimal and the likelihood of it being a contaminant from Chandler’s skin during the harvest procedure is high. However, with a bone marrow transplant, doctors are ultra cautious. The doctor quickly wrote orders for the nurse to obtain a blood culture from Ashtyn and start the antibiotic Vancomycin. While Vancomycin was being infused over an hour, Ashtyn had a side effect to the antibiotic called “red man syndrome.” Her scalp turned red and her face was flushed. The rate of the infusion was slowed down and Benadryl was given to lessen the symptoms. Methotrexate is another drug that Ashtyn is taking. She is given a dose of Methotrexate on post transplant day 1,3, 6, and 11 to help minimize graft versus host disease (when Chandler’s immune cells attack Ashtyn’s body). Mucositis is the side effect from total body radiation previously received and the doses of Methotrexate. By Day 10, whatever the severity of mucositis she has should not get worse. However the mucositis will not be able to get better until engraftment and healing blood cells are produced. One thing that is very important to the staff is to keep the pain that Ashtyn will experience to a minimum. She is beginning to feel pain in her throat as mucositis is becoming apparent. The severe pain in her feet continues to be a side effect from the drug Cyclosporine, which is also used to minimize graft versus host disease. The goal is to keep pain under control rather than try to “play catch up.” It is much easier to manage pain if it is not allowed to get out of hand. 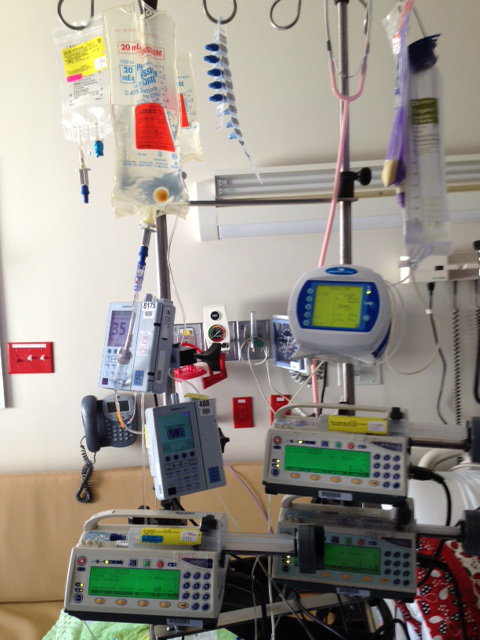 A morphine patient-controlled analgesia (PCA) pump will soon be started. The idea of the PCA pump is to give Ashtyn control of when she gets morphine. She can push a button any time she is feeling pain increase. The pump will allow her a maximum of one push every 10 minutes with an hourly maximum dose. The doctors can always increase or decrease the maximum morphine dose depending on how well her pain is being controlled. Her oxygen saturations will constantly be monitored while on morphine because of the risk of shallow breathing and decrease of oxygen in her blood. I’ll take the “bad” opposition to enjoy the “good” opposition any day. Today Ashtyn was able to have a smooth day without any surprises. She had her home health nurse visit without any obligation to do so other than to raise her spirits. During the evening she had one on one time with her dad. What 12 year old gets five hours of one on one time with their dad with very little distractions? I was also able to enjoy one on one time with Ashtyn. What mom gets hour upon hour, day after day, one on one time with their 12 year old daughter? I was also able to spend time with a dear friend at the pool and spend time with my three other children worry free. Post Transplant DAY 1: All paths are crossed for a purpose. Ashtyn woke up feeling decent and had a rather uneventful day. Uneventful is wonderful. Even though she doesn’t feel as well as she would like, she looks good. Today she spent most of the morning and afternoon sleeping. During the evening she watched movies while her dad rubbed her feet. Twice a day she receives an anti-rejection medication called Cyclosporine. She has had horrible foot pain as a side effect. Her feet feel as if she had just walked several miles in the tightest fitting shoes. Throughout the afternoon and evening she was given Oxycodone and Tylenol to help with the pain. 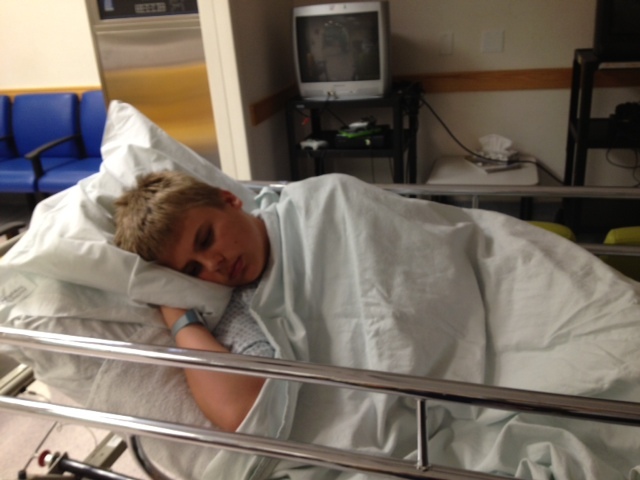 Before going to bed for the night they tried a dose of morphine which really did the job. She fell asleep pain free. Ashtyn’s mouth is beginning to show signs of mucositis with a greenish/white tongue and reddened throat. Her tongue is also beginning to have ridges on the edge instead of being smooth. Four times a day she swishes different mouthwashes to help control mouth infections and hopefully lessen the mucositis to some degree. Though there are signs that mucositis will soon be rearing its ugly head, she ate fruit loops for breakfast, 1/4 of a cup of noodle soup for lunch, and 1/2 serving of Top Ramen for dinner. 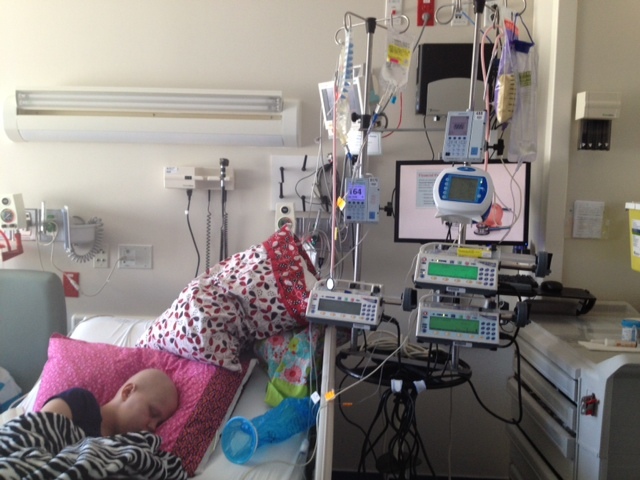 She is getting IV nutrition, TPN and lipids, to make up all the nutrients she needs. Day one is behind us. It was a good day. We will take each day as they come and continue to see our blessings in all things. One of the most precious blessings during Ashtyn’s battle with cancer has been the interactions we have had with people. We have been able to interact with many inspiring and loving people, through email, messages, and visits. Two of these interactions happened in the last couple of days. The first was with Julie. She wrote a message on Facebook, “Hi Ashtyn! I just saw your story on KSL. My little boy is here at the hospital waiting for a new heart. We learned about him just a couple of weeks before you learned about your cancer.” Julie and I decided to meet at church on Sunday and then spent over an hour talking in Ashtyn’s room. Monday, Julie and I ate lunch and dinner together in the hospital’s family lounge and talked as if we had known each other forever. Ashtyn was facing her bone marrow transplant the following day and Julie didn’t know if her son Zack would live long enough to receive a heart transplant. On Tuesday morning, as Chandler was getting ready for surgery to donate his marrow, Julie found out they had found a perfectly matched and sized angel heart for her son. Our children were diagnosed the same month with life threatening health problems and were both getting a transplant the same day. Her son will be in the hospital for close to the same amount of time Ashtyn will be in the hospital. Once home they will both experience the same “bubble boy/girl” precautions and will forever share their transplant birthday on June 11th. Tonight I received a text from Julie. “I know it’s late. Hope I don’t wake you! Just wanted to send my love and let you know I’m here if you need me. Sending prayers for a restful night your way. xoxo.” Oh how that warmed my heart. The second interaction I had was last night. I went to dinner with a few of my girlfriends for a girls night out. (“Women thrive both emotionally and physically from close friendships with other women. These bonds are important for female well-being and livelihood.” UCLA study) The night built me up. Not only did we eat yummy food with great conversation, I was able to meet Kathy. Kathy’s 7 year old, Alex, was diagnosed with DIPG (Diffuse Intrinsic Pontine Glioma, a tumor located in the middle of the brain stem) in November. He passed away April 11th. The ladies and I sat at the restaurant table for four hours talking and talking and talking, the way only girls do. I was so impressed and touched by my friends’ love for each other and also by Kathy’s tender faith and strength. My heart overflows when I think of all the interactions I have had with family, friends, neighbors, staff members, and strangers since Ashtyn has been diagnosed with cancer. A lesson I have learned is that all paths are crossed for a purpose. Interactions and relationships that may seem random are in fact there to bless our lives. I have instantly felt connections with so many who love and support Ashtyn. I can’t possibly think we are strangers. I can’t possibly think those who are and have been in my life, or are a part of Ashtyn’s Army, came about from a random coincidence. I can only assume that the people we interact with on earth are those we interacted with in heaven. What a blessing you have been in my family’s life. That is the way God intended, for His children to take care of each other and be instruments in His hands to bless others. I have learned the importance of sharing my life with others as Julie and Kathy shared their life with me. I know Ashtyn is where she is today because of all those who have come into her life with love and support. Her army. No matter how dark the world may seem, I think there is more good than bad. I see it every day. Happy Bone Marrow Transplant Birthday! This isn’t the first or last time Chandler will change the world for good. 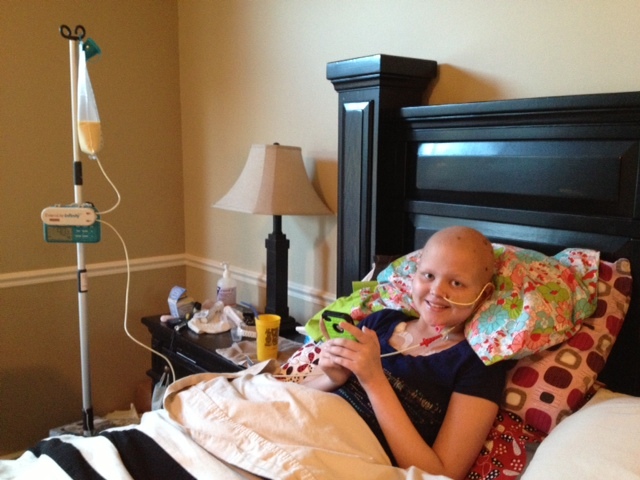 The marrow transfusion went into Ashtyn’s central line fairly quickly and without a problem. A few family members came to celebrate with us including Ethan and Morgan, my two younger children. There was a happy and light spirit in the room. By 3 p.m. everyone left. Chandler went home to rest and play XBOX. Ashtyn stayed in the hospital and took a nap. Today was a big day. The next big day we are waiting for is Engraftment Day. We will all be watching for signs of engraftment which usually takes 14 to 21 days after the transplant. 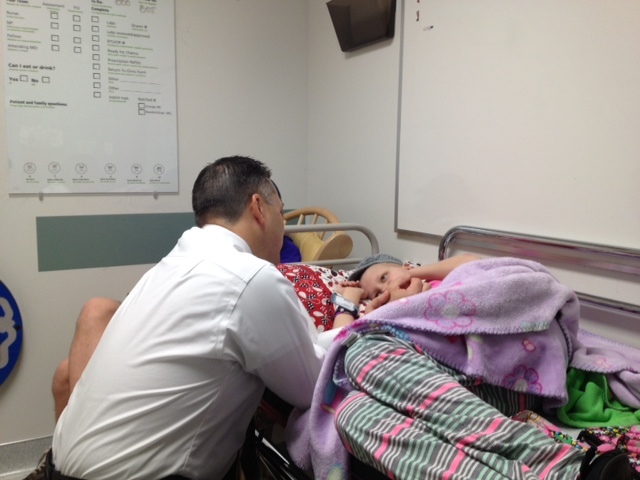 Once engraftment occurs, Ashtyn will begin to feel better and will be on the road to going home. 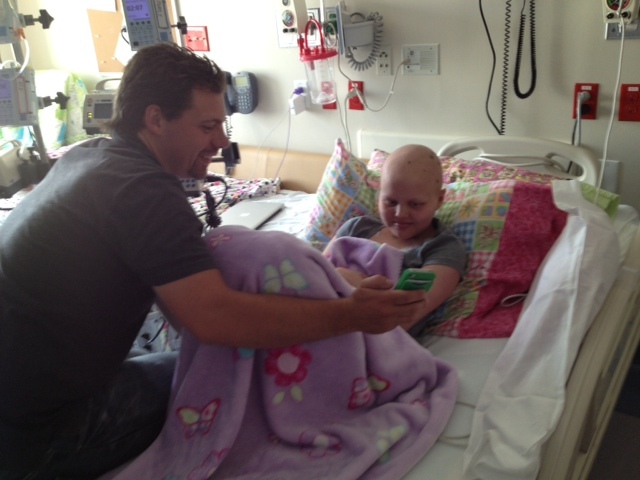 Engraftment is when Chandler’s stem cells start to grow and make healthy blood cells in Ashtyn’s body. 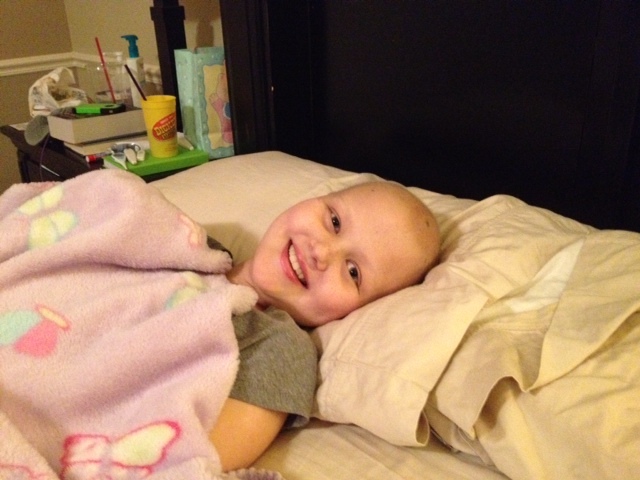 Each day Ashtyn will have blood tests while waiting for the donated cells to engraft. A complete blood count (CBC) test will show the kinds and numbers of healthy cells in her body. The types of blood cells that are counted to measure engraftment are neutrophils, which are a type of white blood cell that are important for fighting infections, and platelets, which help control bleeding. An absolute neutrophil count (ANC) of 500 or more for three days in a row is a sign of engraftment. 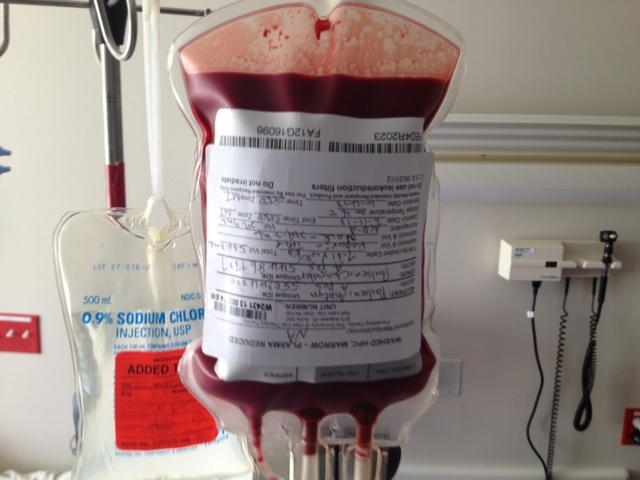 A platelet count of 20 to 50, without a platelet transfusion, is a mark of platelet engraftment. The staff and bone marrow team use a number system to keep track of days after the transplant. Transplant day was Day 0. The day of engraftment will be a day of great celebration and gratitude. Each day we will pray for a quick and smooth engraftment. The transplant team gave Ashtyn a calendar to tape on her wall so we can keep track of what day post transplant we are on. 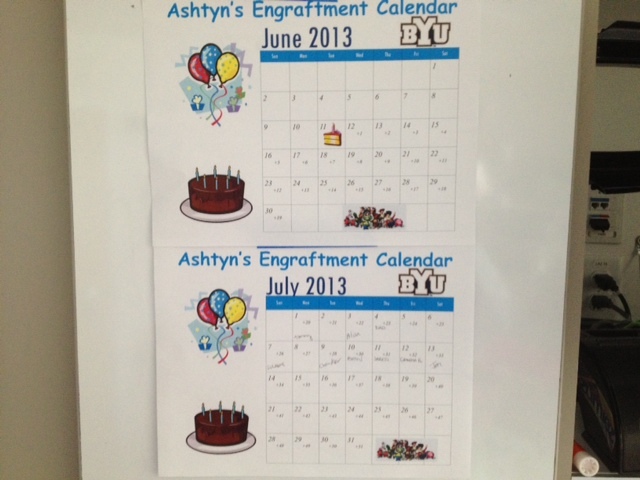 It is a tradition that people place bets on what day they think Ashtyn will engraft. The name of those who guess is written on the predicted day. Whoever wants to can bet one dollar and place it in an envelope below the calendar. The winner gets recognition, Ashtyn gets the money. Four days ago, when Ashtyn and I were driving to the hospital to be admitted for the transplant, she said, “I think I am going to come home on July 14th. Actually, I think it will be the Sunday that is closest to July 14th.” I looked at my calendar. 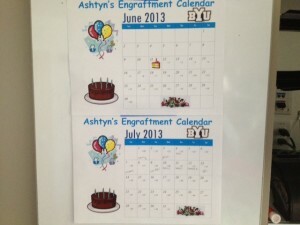 “July 14th is a Sunday.” She said, “Well then that’s the day I think I will be going home.” Ashtyn guesses she will engraft July 10th and will go home on July 14th. What’s your guess? Ashtyn felt fairly well today. The night before her transplant she threw up her NG tube. She no longer has a tube and is no longer getting tube feedings in her stomach. Though her nausea has decreased from yesterday, she doesn’t have an appetite to eat much so IV nutrition (TPN and lipids) will be started. Her ANC is currently zero and will remain that way until engraftment. To help prevent infection, she was started on an antibiotic called Cefepime for bacterial infections and Amphotericin B for fungal infections. It is just a matter of days before mucositis will start affecting her. 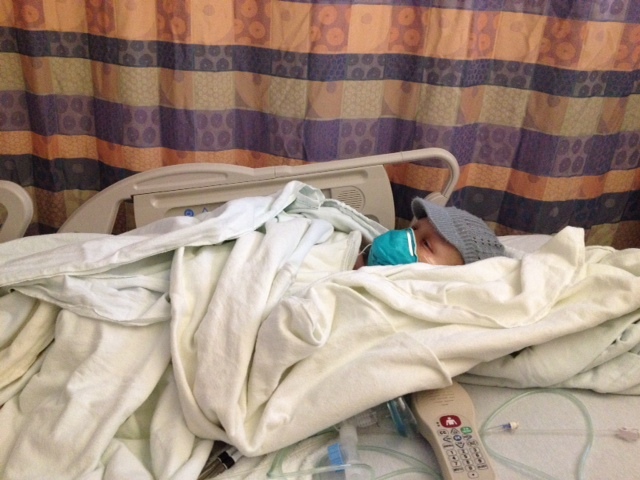 In February Ashtyn had severe and extreme mucositis. Every day we pray that her mucositis will be less than it once was. Every day we pray that she will be safe. We are grateful for where we are today. 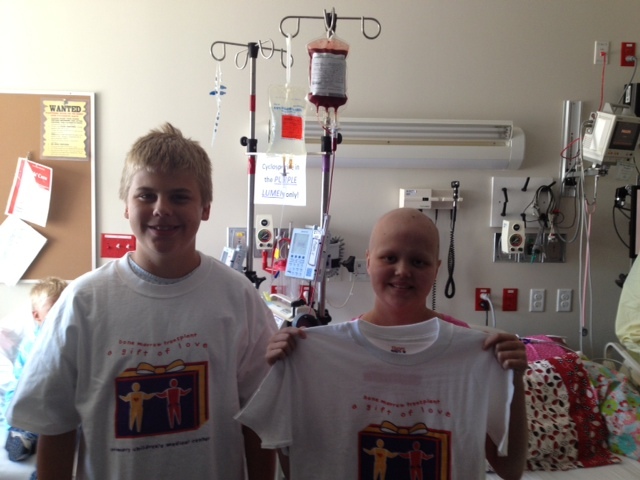 We are grateful that Chandler was a match and that Ashtyn had the chance to have a bone marrow transplant. 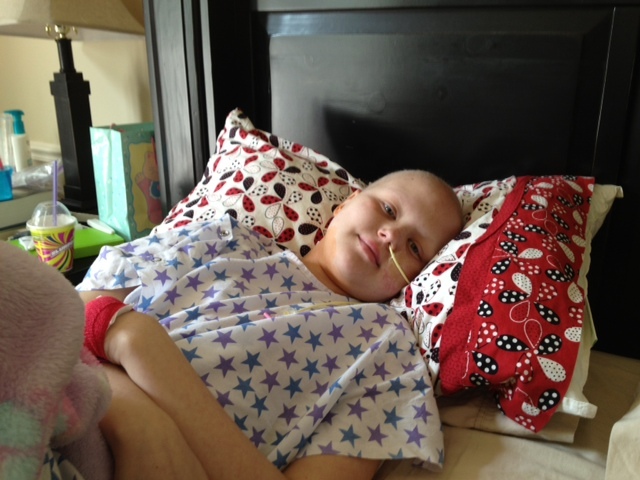 We are grateful for past cancer children pioneers who have paved the way for Ashtyn. We are grateful for the inspired research that has been done and the knowledge health care providers have. We are grateful for a merciful God who blesses the details of our lives and sends earthly and heavenly angels to assist us. We are grateful for trials and struggles that stretch and refine us so we can progress and become who we need to become. Ashtyn has finished her second day in the hospital finishing up her preparation for her bone morrow transplant that will occur tomorrow. 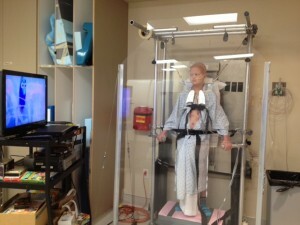 She is experiencing the effects of her eight previous radiation treatments and does not feel well. Nausea comes and goes. Sometimes it’s a mild, lingering feeling. Other times the nausea comes as an intense wave. All in all, she has a generalized “icky icky” feeling. Her will-power is impressive. Most of the time she can breathe through the nausea as I sit behind her with one hand on her forehead and one hand on her stomach. She has only thrown up twice in the last two days. She continues getting nutrition through her NG tube in the form of formula. The longer she can tolerate feedings in her stomach the better. Medications she is currently taking include: Prevacid and Reglan to help with digestion. Dexamethasone, Ativan, Benadryl, Phenergan, and Zofran to help with nausea. Flagyl to treat her current C-Diff diagnosis. Acyclovir to keep her cold sore virus from flaring up. Mesna to help prevent damage to her bladder from the chemo that was given. Pentamidine was given to help prevent a certain type of pneumonia seen in immunocompromised patients. 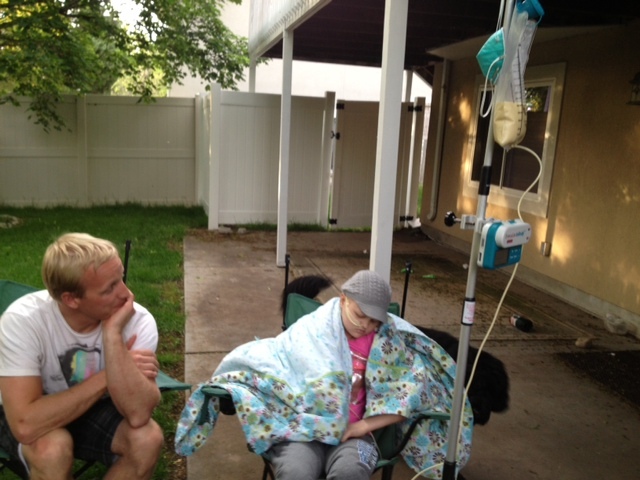 She also received a high daily dose of the chemo drug cyclophosphamide for two days. 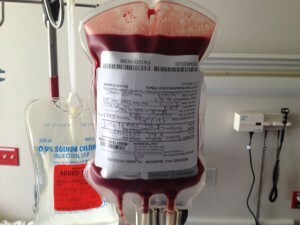 A transfusion of IVIG (intravenous immune globulin) was given which is a collection of antibodies that may help to prevent some viral and bacterial infections. Cyclosporine is a medication she gets to prevent rejection of Chandler’s new immune system. It will be given to Ashtyn for roughly a year and stopped when there is clear evidence that rejection is no longer a threat. In about five days she will start feeling the complete effects of the radiation, chemo, lack of marrow, and absence of white blood cells in her body. The doctors and nurses will spend their time giving supportive care to prevent and treat infections, side effects of treatments, and complications. They will deal with side effects of medications, radiation, chemotherapy, and neutropenia (low white blood cells). They will support her while she is deficient in nutrition, experiences pain from mucositis, deals with high blood pressures from excess fluid, and other possible issues with her lungs related to fluid and/or narcotic effects. 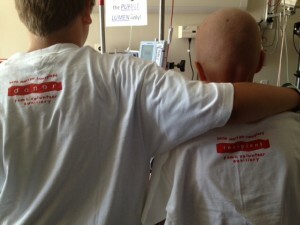 They will give red blood cell/platelet transfusions and monitor for reactions. Medications will be given to try to manage bacterial, viral, and fungal infections, nausea, transplant rejection, pain, liver stress, and high blood pressure. They will give care in multiple ways as we all wait for her body to accept Chandler’s stem cells and build a functional marrow producing the healthy blood cells she needs. I will communicate with hospital staff and try to be in tune with her needs. I will spend my time taking her to the restroom often, helping her with mouth care four times a day, giving her a bed bath and keeping her lotioned once a day, and making sure her room is clean and hands are washed. I will lay with her, tickling her arms, face, stomach, and back. Ashtyn will watch Disney movies, listen to calming music and the audio book “The Candy Shop War”, and sleep. She will spend her time being patient while she endures the things that lay before her. I sense a powerful inner strength about her. We feel peace that she is ready and has all the tools she needs. Bone marrow is a spongy tissue found inside of bones where all of the blood cells are produced. Every type of blood cell in the marrow begins its life as a stem cell. A stem cell can be called a “parent cell” because it divides and forms the different cells that make up the blood and immune system. Stem cells produce white blood cells that fight infection, red blood cells that carry oxygen, and platelets that are clotting agents. 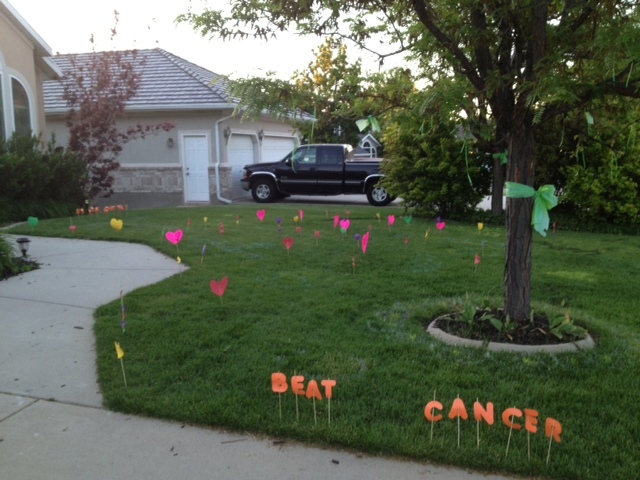 Ashtyn has a high risk, rare leukemia. She was very blessed the chemotherapy used during her 2nd round in mid-March was effective and killed all her cancer cells. Though the cancer is gone, there is always the risk that the cancer will come back (relapse). With each round of chemotherapy, cancer cells become more resistant making it more difficult to kill them if they do come back. If Ashtyn were to relapse, there is no guarantee that the chemo would completely kill her cancer again. In order to do a bone marrow transplant, a patient should be 100% cancer free. Since Ashtyn is cancer free the idea is to do a bone marrow transplant now to minimize the risk of relapse and provide Ashtyn with the best chance for a long-term recovery. The idea of a transplant is to replace someone who has unhealthy marrow with marrow from a healthy donor. Chandler, Ashtyn’s 14 year old brother, had a blood test in February and was found to be a perfect 10/10 genetic match for Ashtyn and will be donating his stem cells to her. Each sibling has a 25% chance of being a match. 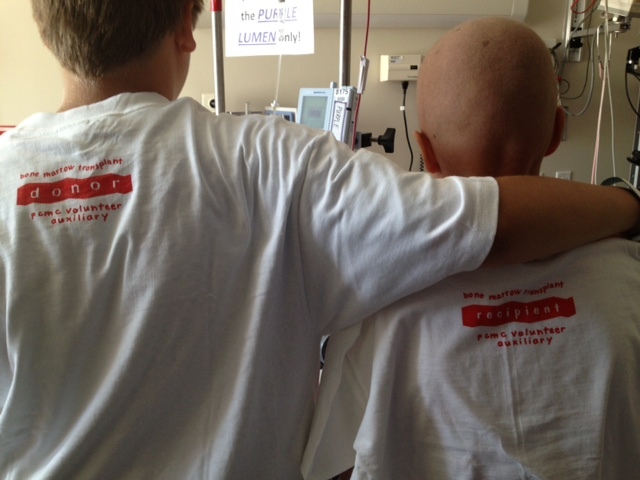 Only 25 to 35% of bone marrow recipients are matched with a sibling. We are very blessed. 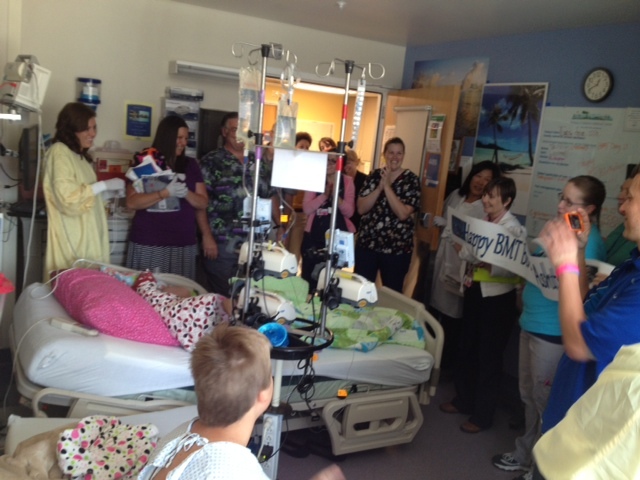 The transplant is the transfer of healthy stem cells from Chandler to Ashtyn. In two days (Tuesday) Chandler will go under general anesthesia in an operating room where his stem cells will be collected from the bone marrow in his hip bones. A large needle will be inserted into the back of his pelvis and marrow will be withdrawn. After the procedure Chandler will experience some discomfort in his lower back/pelvis for a few days, but he will go home that day. There are no long-term effects of the procedure or donation on Chandler. A bone marrow transplant is a difficult procedure to go through. Ashtyn received eight rounds of total body irradiation June 4th- June 7th. She is now receiving high doses of chemotherapy June 8th and 9th. The purpose is to eliminate whatever bone marrow and stem cells she has left and make room for the new marrow to be transplanted. On Tuesday June 11th, the stem cells from Chandler will be put into Ashtyn through her central line like a blood transfusion. 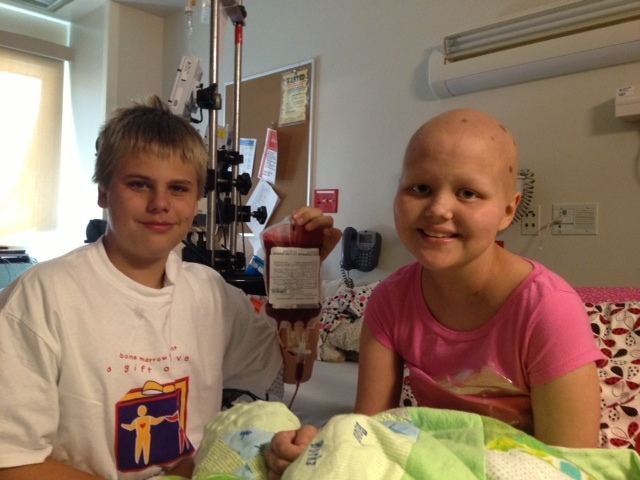 The stem cells will then find their way to Ashtyn’s marrow and mature into different blood cells. “Engraftment” occurs when Chandler’s stem cells begin reproducing enough new blood cells that they are measurable in the peripheral blood. Engraftment usually occurs between 15 to 30 days. Engraftment day is a huge day for Ashtyn. She will physically begin to feel much better when engraftment occurs. When engrafted, her immune system will be Chandler’s immune system. Her cells and blood will be Chandler’s cells and blood. They will have exactly the same blood, 100% DNA matched. Supportive care is needed while Ashtyn has an ineffective bone marrow, waiting for her new marrow to mature. Antibiotics, anti-fungals, and antiviral medications are given to help prevent infection. Blood tests will be done frequently to check medication levels, blood counts, signs of infection, side effects, and a host of other things. Red blood cell and platelet transfusions will commonly be done while Ashtyn’s marrow is unable to produce cells and as Chandler’s marrow is maturing enough to do so. Nurses and doctors will also monitor Ashtyn’s vital signs closely and strictly measure the fluids she receives and puts out. Great effort will go into providing the most protected and sterile environment possible. Ashtyn will not be allowed to leave her room. Everyone will wash their hands meticulously. Physical therapy will help Ashtyn exercise a few days a week. There are quite a few complications and side effects that can occur with a bone marrow transplant. Here are some of the things you can pray will be minimal for Ashtyn: Infections, mouth sores, mucositis (inflammation of the mouth and GI tract), nausea, vomiting, pneumonia, high blood pressure, low blood pressure, respiratory distress, blood transfusion reactions, graft failure, graft vs. host disease (when Chandler’s immune system attacks the tissue of Ashtyn’s skin, liver, or digestive tract), and liver, kidney, or heart damage. When Ashtyn’s absolute neutrophil count is above 500 for several days, if she is free of infection, and if she is able to take necessary medications by mouth, she can go home. It will be required that she stay within 30 minutes of Primary Children’s Hospital in case of an emergency for at least 100 days after the bone marrow transplant. She will also return to the outpatient clinic frequently for blood work, exams, and potential blood transfusions. As time passes after the transplant, the frequency of clinic visits will decrease. If a fever ever arises, Ashtyn will be admitted into the hospital for antibiotics until the fever is gone. We are grateful to live 20 minutes from the hospital. I admire the strength of families with bone marrow transplant kids who live further than 30 minutes from Primary Children’s who must relocate for 100 days to ensure their children are safe. 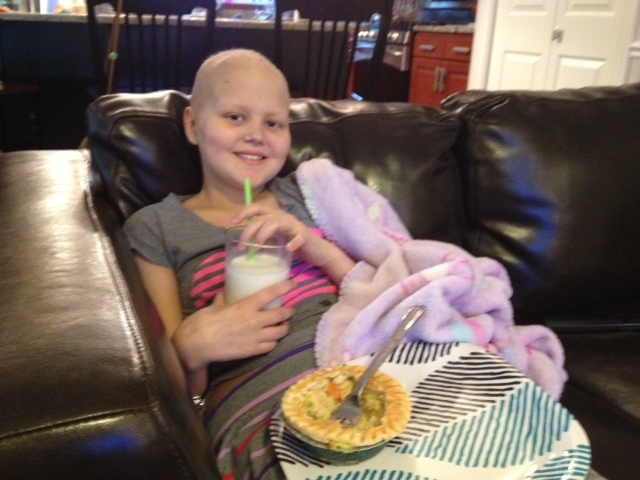 Ashtyn is on a very restricted “antimicrobial diet” and she will continue to be on that diet for several months. She is not allowed to eat certain cheeses, deli meat, deli or restaurant food, uncooked herbs or spices that are added to food after cooking, bleu cheese, commercial salsa, certain raw vegetables, fruits, berries, raw nuts, soft-serve frozen yogurt, ice cream, milkshakes, frosties, slurpees, snow cones, and movie popcorn. She has to have individual, single-serving containers of things like butter, mayonnaise, chips, cookies, candy, and anything else that is bulk, typically left opened, and used more than once. If a food item is cooked or opened and not eaten within 30 minutes, the remainder of the food or drink must be thrown away. Anything that is cooked must be heated to 165 degrees to assure it’s safety. To fully recover from a bone marrow transplant takes a while. It will take months for Ashtyn to regain her energy level and a minimum of 9-12 months for her immune system to return to its normal function. She will not be allowed to return to school, crowded events such as church, movies, parties, or restaurants, or to swim in lakes or pools until her immune system shows significant signs of recovery. As you can see, the next several weeks and months have the potential to be very challenging and stressful. Even though there are many reasons to worry or be scared about what might or could happen, our family still is experiencing the peace that has come to us as we know God is watching over Ashtyn. He has been in charge from the moment she was diagnosed, and long before that. The prayers and support you continue to offer on our family’s behalf are physically and spiritually felt. We feel immeasurable strength from all you continue to do for us. With your continued prayers and God’s loving care, it is all going to work out. Monday followed a pattern that Ashtyn and I have become very used to. It was unpleasant and tough, then enjoyable and fabulous. It started out at noon when we went to Primary Children’s Hospital for a check up, final transplant teaching, and paperwork. By 1 pm we had not been seen by the transplant team. 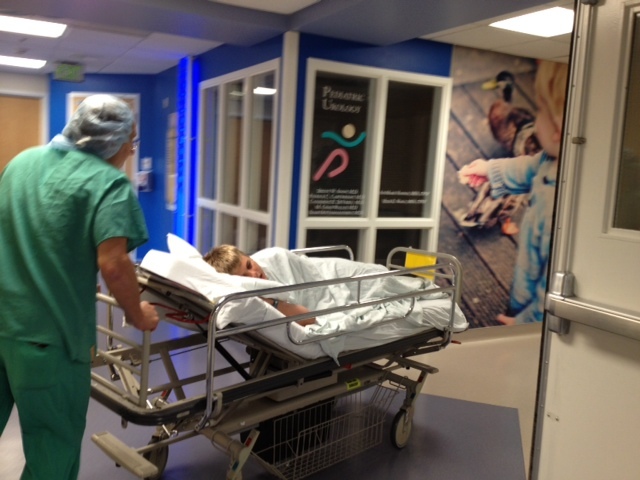 I informed the nurse that we needed to be at the Huntsman Cancer Hospital at 2 p.m. for measurements. At 1:30 we finally met with the transplant doctor to start the paperwork and transplant discussion. By the time we got to Huntsman, we were 20 minutes late and because of that were pushed to a 4:30 p.m. appointment. They were kind to get Ashtyn a room where she slept while waiting. By 6 p.m., after countless Xrays and lead repositioning, they were still unsuccessful. The concern was that the next morning Ashtyn was to come in for her first radiation treatment and the lead needed to line up perfectly by then. 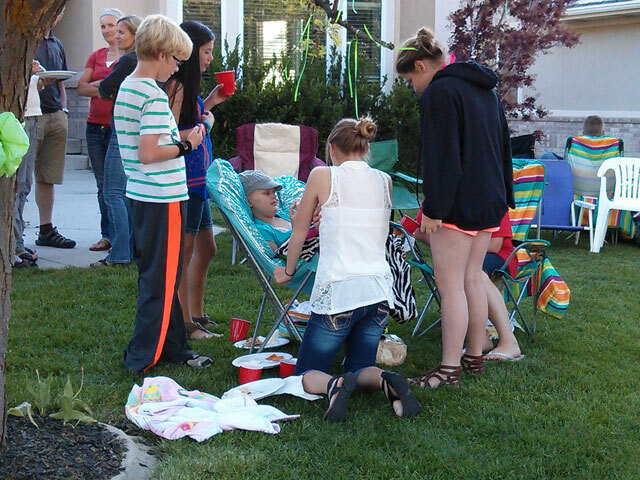 However, Ashtyn had been enduring the procedure long enough and she had a BBQ that was just starting. Ashtyn left the hospital feeling that the day was a waste and she was very worn out. 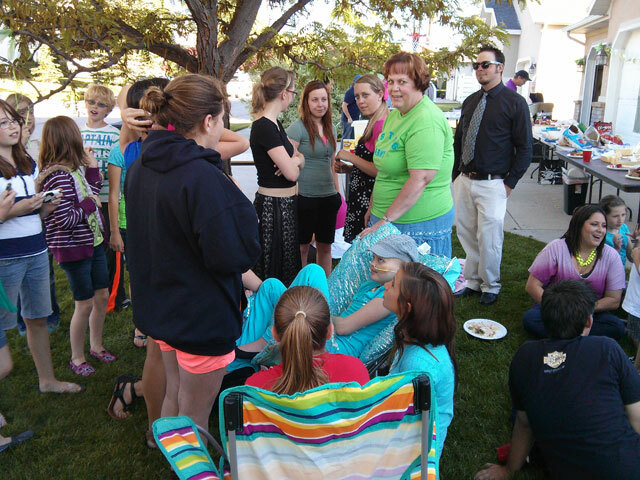 We arrived 30 minutes late to her pre transplant BBQ. It didn’t matter. The greeting from friends, family, neighbors, and strangers was enough to help us forget our day. Ashtyn sat in the middle of the grass on her chair, and spent 2 1/2 hours surrounded by a lot of love. How do I express in words my appreciation to those who took time out of their evening to come to the party and show such love and support? How do I express my gratitude to all those who were unable to come but care so deeply for Ashtyn and keep her close in their hearts? We know this would be a much more difficult experience if we didn’t have all the thoughts, love, care, and prayers that we get from you. It is now T-minus 5 days until Ashtyn’s bone marrow transplant. 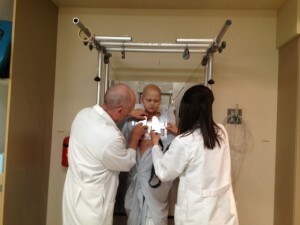 She is on her third of four days of total body radiation, the purpose of which is to kill her bone marrow. 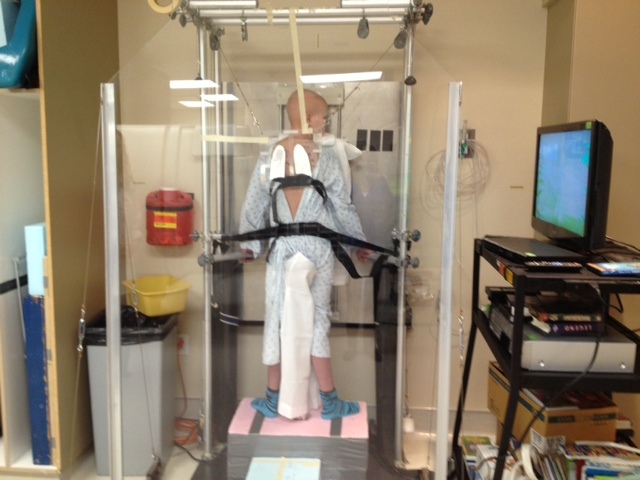 Each morning she goes to Huntsman Cancer Hospital at 8 a.m., dresses in a gown, is strapped to the contraption for front body radiation for 20 minutes. She is then turned around and stands for another 20 minutes to do her back side. Afterwards I drive her home where she sleeps and relaxes in bed. At 4 pm we head up for another radiation treatment, two hours later we drive back home, and she rests in bed the remainder of the night. Nausea is a common side effect people get with radiation. To help, I give her anti-nausea medications before heading to the hospital and also throughout the day. Other than being very tired and nauseated off and on, she has tolerated radiation well. She is the bravest girl I know. *Please pray that she will continue tolerating radiation with minimal side effects. *Please pray for a safe bone marrow transplant. Ashtyn was given a “heart attack” from her youth group Tuesday. So sweet of them. Things are ever changing. 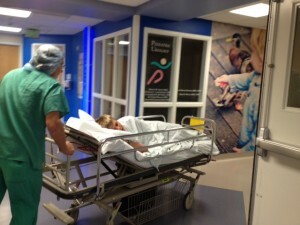 Three days ago (Thursday) Ashtyn had surgery. She was so brave. On the way to the hospital we discussed whether or not she should get a new NG tube. Knowing that in the near future she would have days of radiation, chemotherapy, and the transplant, she wondered if she would be able to have the energy and desire to eat the needed 1500-1800 calories a day. “What will make you more happy?” I asked her. She decided that an NG tube would take the stress off of having to eat all the needed calories. 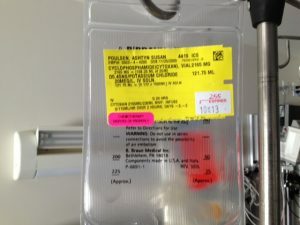 The plan was that she would eat what she wanted during the day and a pump would infuse formula through her NG tube into her stomach while she slept at night. Ashtyn felt good about this decision because it was her decision. And what made it most appealing is that the tube would be placed into her stomach while she was under anesthesia during her scheduled surgery. An oncologist talking to her. The doctors treat her so good! What was she having surgery for? The bone marrow transplant team wanted her to have a new Broviac central line to be sure she started the transplant with an infection free central line. While under general anesthesia, a catheter was inserted by a surgeon under the skin of her chest wall and into a large vein that leads to the heart. A small incision was made near the collarbone where the tip of the catheter enters the vein and then it is threaded into the superior vena cava, right above the heart. 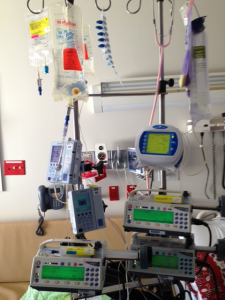 The central line allows her to receive all the needed IV fluids, medications, and lab draws without having to be poked. The following day, Friday, we discussed what we should do that night. Ashtyn’s time at home is limited and I felt it would be good for her to get out. At 4:10 p.m. Chandler suggested we go to a movie. I got on-line and noticed the movie “Ephraim’s Rescue” was playing at 4:30 p.m. and it appeared to be have a fairly empty theatre. The movie theatre was 15 minutes away. “We better hurry.” I am so glad we made it. 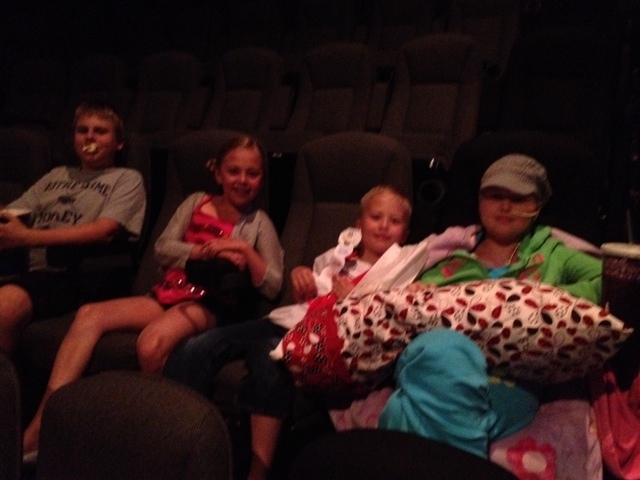 The movie was a must see and Ashtyn enjoyed being out of the house way more than she thought she would. Saturday Ashtyn agreed to go to the pool. Upon arriving, we placed her chair under the shade, got her a large Powerade and chicken strips, and she relaxed in the peaceful setting for 1 1/2 hours. 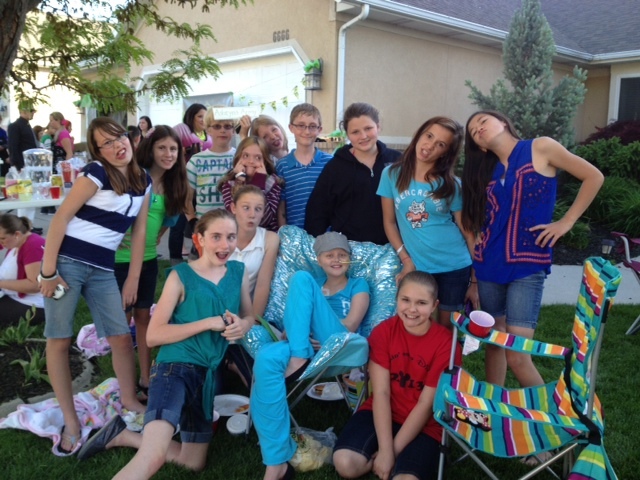 Since being diagnosed with cancer, Ashtyn rarely has had energy and endurance to be social. There have been occasions where she has enjoyed friends, however the majority of the time she has been overwhelmed in social settings. That is why I was shocked when on Saturday night she voiced her desire to have a party. She wanted a party where anyone and everyone was invited. “It’s my last chance until next summer.” And that’s true. Tomorrow Ashtyn is starting radiation therapy, which I consider to be the first day of the bone marrow transplant count down. 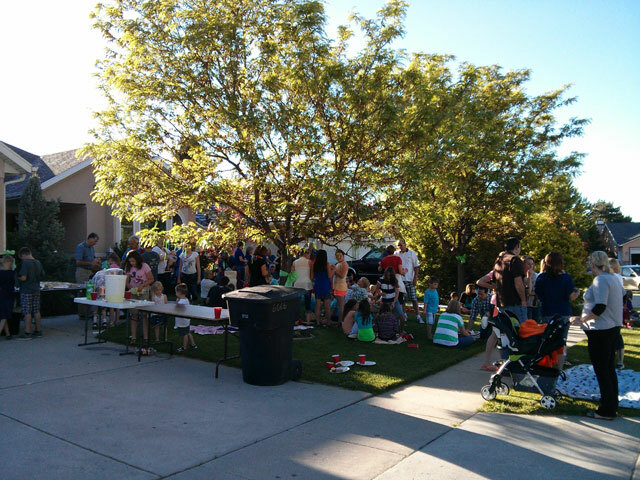 Monday was the only option for a party. What have I learned about cancer? Just go with it. No matter how crazy it might be, her dad and I quickly agreed to have a last minute BBQ for anyone who would like to come. 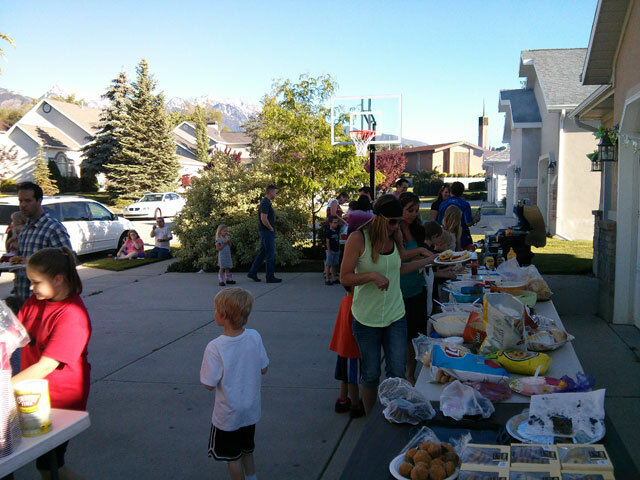 She also wanted a party with her grandpas, grandmas, aunts, uncles, and cousins. I immediately sent out a mass text asking if family would come the next day for a dessert party. 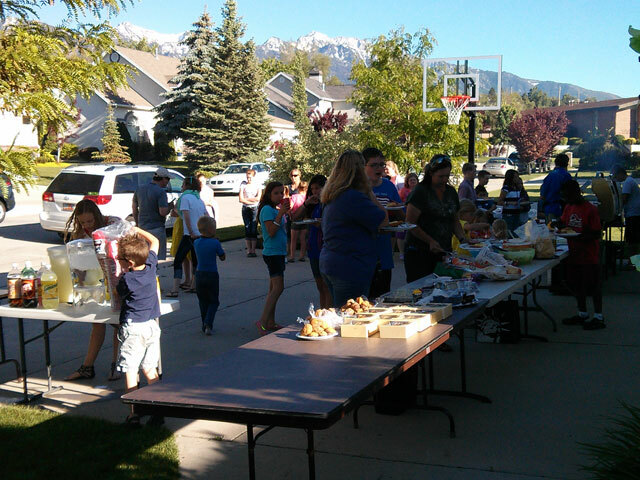 Sunday, she had two grandpas, two grandmas, seven aunts, five uncles, and eight cousins show up. 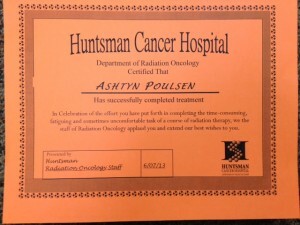 I am grateful and proud of Ashtyn for not losing herself to cancer. She is a social girl who has always thrived when she is around people. Her body is tired and it’s difficult for her to handle a lot of stimuli, but she is letting her spirit take charge. Since I will be back in the hospital shortly, I would like to have a BBQ to celebrate the beginning of my bone marrow transplant. I would like to invite anyone who would like to join. I would love to see my army there. Use the contact link and email my mom if you need my address. It will be at my house on Monday the 3rd from 6-9 pm. We will be serving hot dogs and hamburgers. If you aren’t able to find a parking place, park at the church. Bring a chair or blanket to sit on. If you want to bring something to share, you can. For those not in the area and those who are not able to come, your support definitely means a lot. RSVP [email protected] so we can get an approximate count on how much to buy. I was really in a funk. I was sad and depressed. I was wasted. I was empty. Totally drained. The past few months took all my fight in me. I didn’t have the urge to keep fighting anymore. I was tired of fighting. Tired of spending time at the hospital. Tired of being sick. Tired of having cancer in my life. But after I threw up my NG tube I realized I have to snap out of it, build up all the energy I can, and do three more months. I am going to get rid of this cancer for good and keep building up to be a better person. I am going to not let my body tell me what to do. I am going to be in charge of my body from now on. I am not going to let it win. I am not going to let this cancer beat me. I am not going to let it get the better of me. I am not going to let it ruin who I am. It almost ruined who I was. I wasn’t taking care of myself. I wasn’t making my body fight. Instead I was laying around, letting my body be sick. Before, I tried so hard to avoid the NG tube. When they told me I had to get one placed I thought, “well this means I’m not strong anymore.” That one thought added to more and more thoughts, “I can’t do this” and “I am not strong enough.” The transplant was scaring me too. I thought, “How can I do it?” I didn’t understand why I had to do all of this. I wished I could just be done with it all and just quit. Just say, “I am done,” drop it, not do the hospital stuff, and not do the transplant. What I really need to do is build up all my strength and just go through a couple of months of this, be done with it, and say “I officially beat cancer!” It will be a short little memory. Since I have to do a few more months I want to make every day count. I want to do my best every day. I want to try and exercise and try to get all the nutrients I can. I want to try and find positive things in everything because I know there are positives in everything. When I’m not in the hospital I want to get out and enjoy the world outside of the hospital. When I am inside the hospital I want to have a laptop and write a book about my trials and my journey. I know it sounds weird, but I want to enjoy being in the hospital. When I am done with the bone marrow transplant I won’t spend nights in the hospital anymore. While I am in the hospital I want to enjoy all the nurses and staff. I want to enjoy the really deep spiritual, temple-like feeling that is there. I want to enjoy spending so much time with my mom because when we are out of the hospital I won’t constantly be in the same room as her. One of my favorite nurses gave me the idea to learn to play the ukulele or guitar in the hospital. That thought has always stuck as a fun idea. I think it would be fun to learn to play and then show him what I can do. I have really good and positive thoughts about the transplant. I know that God will have my back and it’s all going to be ok. I am going to have my mom there the whole time. Right now I can imagine my future. I can see myself going to my mom’s house to visit her while my kids are at school. We will sit on the couch and talk. She’ll say, “Ashtyn do you remember all those months we spent in the hospital?” And we can just talk about it. She was there with me through the entire thing and knows more than anyone what I went through. When I feel down during the transplant I will be able to read all the comments on my blog and Facebook which will give me that extra boost. It really comforts me to know that I have so many people out there following me and supporting me. Whenever anyone comes up to me and tells me they have been reading my blog, I feel like I know them. They know what I have been through and it makes me so happy to have people care. When someone tells me that they are following me, I have an instant love for them. I wish I could reply to all the comments I get. I do read all of them. I care about all of them and they make me happy. I don’t think of people who follow me as strangers. I think of them as part of my Army and my close friends. We are all in this together. I can’t wait to have a big party. I am going to invite every single person in my army and would love to talk to all of them. Without Ashtyn’s Army, this trial would be so much more hard to deal with. They take such a load off my shoulders. I am really grateful I have so many people supporting me. When I’m really sad or sick, not only do I have the Army fighting with me I also have angels. It’s like what Mattie and Kim commented about on Facebook about the pioneers who felt angels pushing their handcarts when they didn’t have the strength to do it on their own. Francis Webster said, “We suffered beyond anything you can imagine, we came through with the absolute knowledge that God lives, for we became acquainted with Him in our extremities. I have pulled my handcart when I was so weak and weary from illness and lack of food that I could hardly put one foot ahead of the other. I have looked ahead and seen a patch of sand or a hill slope and I have said, I can go only that far and there I must give up, for I cannot pull the load through it, the handcart began pushing me. I have looked back several times to see who was pushing my cart, but my eyes saw no one. I knew then that the Angels of God were there.” I really do feel angels have been pushing my cart along the way. 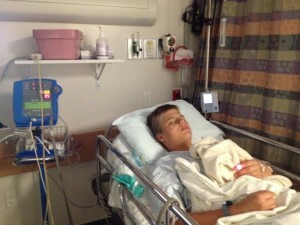 I am surprised that going under anesthesia doesn’t scare me anymore. I am surprised that I’m not scared to go to surgery to get my new central line tomorrow. I am surprised I can drive to the hospital without flipping out and not being insanely scared. I can talk to people without being shy. I can do amazing things, much more amazing than I thought I could do. I now know all these medical terms. I can talk to my dad about all these medicines. It’s so weird. It’s so surprising what I can do now. I thought I was strong before this. The divorce made me so strong but now words can’t describe how amazed I am with myself. I wouldn’t be anywhere near like this without God. I am nothing without Him. 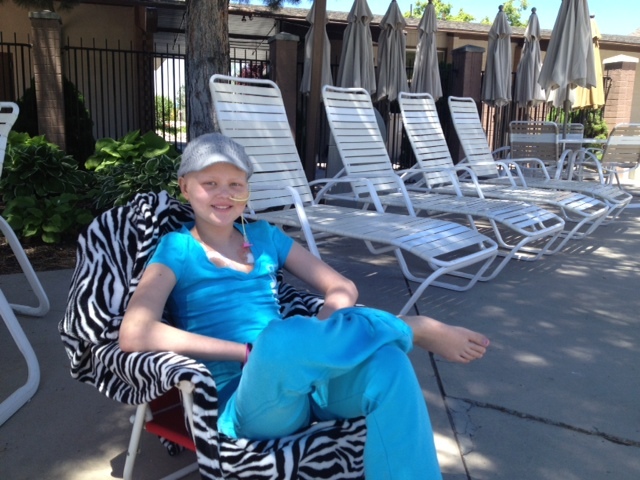 Three hours later, she left the hospital and was taken directly to the pool. It was Memorial Day which is a day we love to spend at the swimming pool. Ashtyn wanted to go home but I insisted she spend some time outside. 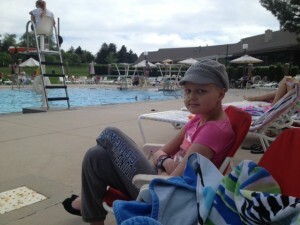 She spent 30 minutes sitting by the pool, not particularly happy, sad she couldn’t swim, and sick to her stomach. Shortly after getting home her Uncle Casey and Aunt Alisa came to visit. Alisa jumped on the trampoline with her daughters while Casey had Ashtyn sit on a camping chair next to him. 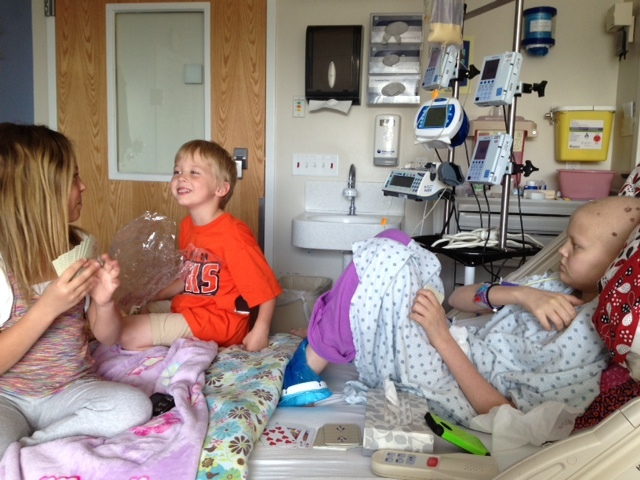 Watching her adorable cousins would have normally brought much joy to Ashtyn, but she continued to not feel well. Casey and Alisa brought cookie dough and made cookies while Ashtyn slept on the couch. 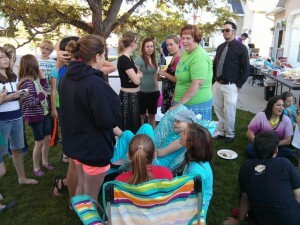 Their efforts for Ashtyn were perfect, but she was in a funk that was proving to be difficult to get her out of. Ashtyn had an IV pole that hung a bag of formula with a tube that fed into a pump and then hooked to her NG tube. The goal was to have the formula infuse at a rate of 75 milliliters every hour, 24 hours a day, to give her the calories and nutrients needed. She couldn’t handle any more than 25 ml’s an hour, which was a problem in the hospital as well. At 5 a.m. she asked that I put the pump on hold so her stomach could calm down. Shortly after waking up Tuesday morning we talked about the importance of getting to the point where her stomach would handle 75 ml an hour. It had been 2 weeks since she first got sick from gallbladder stones and she hadn’t eaten well since. It was imperative that she got off the starvation path. I left the room and shortly came back as she was throwing up in a bag. Before we knew it, she had thrown up her NG tube. The tube went in her nose and out her mouth. My head raised to heaven as I shook my head asking God, “Why? After two weeks, why is she still throwing up? After two weeks, why does her stomach still not handle food? She needs food desperately. Losing more weight would be detrimental. Why? What is the purpose? So far, after each stumbling block, I have seen a purpose and blessing in all things. I honestly see no purpose in this.” She attempted to put the tube back down her throat and into her stomach. “Mom, if I eat all the calories I need, can I not have the tube? I learned my lesson about avoiding food. I will eat.” I took the tape off her face and pulled out the tube. Saturday: Feeling worn out and spent. Sunday: Siblings trying to cheer Ashtyn up. Monday: Casey trying to cheer her up but continues to feel down. Tuesday: Tubes out and feeling good. Tuesday night: Going to bed happy with positive thoughts and ready to fight.